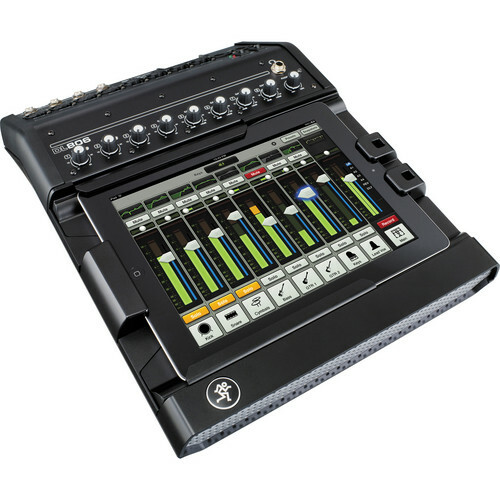 The DL806 iPad-Controlled 8-Channel Digital Mixer with 30-Pin Connector from Mackie allows the entire process of live-sound mixing to be controlled by an iPad with lightning connector. The DL806 features 8 Onyx microphone preamps, 24-bit A/D & D/A converters, powerful internal DSP processing and an iPad docking faceplate. The DL806 has 4 XLR inputs, 4 XLR/TRS combo inputs and 4 aux sends. Integrate your Apple iPad and complete the setup for a live-sound mixing experience that takes advantage of the iPad's touch screen capabilities and wireless control. With the Mackie DL806's seamless wired to wireless mixing capabilities, you can mix in real-time from anywhere in the venue on your iPad (requires wireless router, sold separately). Instantly adjust mix functions from tuning front of house trouble spots to ringing out stage monitors. The Mackie DL806's 24-bit Cirrus Logic AD/DA converters offer a remarkable 114 dB dynamic range. The DL806 is big on security. The PadLock feature locks down your iPad for permanent installs, while the Kensington lock -- the industry standard in protecting technological equipment -- secures the mixer to guard it from theft. Box Dimensions (LxWxH) 18.9 x 18.5 x 6.1"
DL806 iPad-Controlled 8-Channel Digital Mixer with 30-Pin Connector is rated 4.7 out of 5 by 3. Rated 5 out of 5 by Eric from Excellent user interface! I have used Mackie analog mixers for 20 years and have always considered then rugged, good-value mxers with some of the best user documentation in the industry. I have also used Yamaha M7CL and LS9 digital mixers, which have very nice feature sets, but not very intuitive user interface - and the Yamaha have been far more expensive. I was looking for a small digital mixer with dynamics and EQ on each channel strip, low latency and low cost. The price and performance of the DL806 looked too good to be true - but I have to say it is almost flawless, I'm very impressed! I wish I had this years ago. The user interface is by far the best feature. You can download the Mackie Master Fader app for free and check it out first without buying anything. Great job Mackie! Rated 5 out of 5 by Mario G. from ALL THE BEELS & WHISTLES ONLY WIRELESS Its everything that you would hope for and more. Nothing at all can even compete. Do yourself a big favor and get yours today. Right now. You wont regret it. Rated 4 out of 5 by Marzek from Lovin It! I just Installed this mixer, works great! the master fader control via wifi makes things really easy.